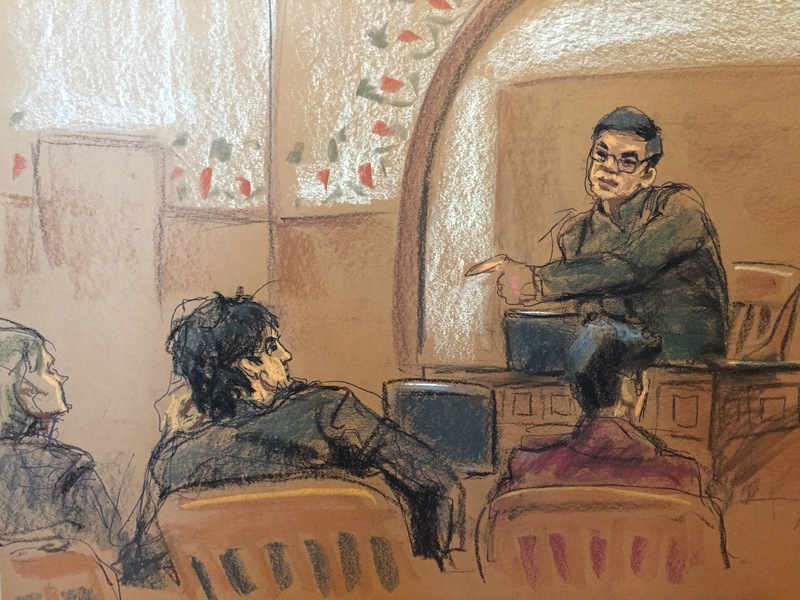 BOSTON -- Jurors in the trial of Boston Marathon bomber Dzhokhar Tsarnaev have been shown a dramatic video of a carjacking victim escaping from Tsarnaev and his brother days after the attacks. The video shows Dzhokhar Tsarnaev going inside a gas station convenience store in Cambridge and filling his arms with drinks and snacks. Then the video shows Dun Meng bolting from a car parked at the gas pumps and running across the street. Seconds later, a man authorities say is Tamerlan Tsarnaev is seen going to the door of the store. Dzhokhar then runs to the counter and puts the snacks down, then runs quickly to the car. The video shows a clear view of Dzhokhar's face even though he wearing a hooded sweatshirt. Meng testified that he had pulled over his Mercedes to check his phone when Tamerlan Tsarnaev entered his car with a drawn gun. "He pulled the magazine out of the gun to show me there's bullets in the gun. He told me, 'You know, I'm serious, so don't be stupid,"' Meng said. "After that, he asked me, 'Do you know the Boston Marathon explosion?' I said, 'Yes, I know.' He asked, 'Do you know who did it?' I said, "No, I don't.' He said. 'I did it and I just killed a policeman in Cambridge.'" Meng believes the carjacker is telling the truth. "Terrified, the whole world everybody is looking for them at the time," Meng says. Last year, the carjack victim, who at the time asked to be identified only as Danny, told his story to CBS News. He said that after he was carjacked, the Tsarnaev brothers took him on a terrifying 90-minute ride. "I think about family, friends, dreams. I thought, 'I cannot die tonight,'" he said. He said he believed the brothers were going to kill him somewhere along the way. On Wednesday, jurors heard a dramatic recording of a Massachusetts Institute of Technology police officer frantically calling for help after discovering an officer who'd been gunned down. MIT Officer David Sacco described receiving a call from a resident who heard loud noises and saw an MIT cruiser in a courtyard on the university's campus in Cambridge on April 18, 2013, three days after the bombings. He said he was unable to reach Officer Sean Collier and sent another officer to check on him. The jury heard a recording of that officer yelling, "Officer down! Officer down!" when he discovered Collier shot multiple times and near death. "Get on it!" the officer yells.